Here are our most Requested Keynotes and Programs. All can be customized to be less than an hour, or expanded to fill one or more days. This interactive, laughter inducing presentation is experienced by audiences nationwide. How do you connect and motivate customers and new prospects to take action in powerful ways. Hold onto your seat! In this fast-paced, humorous and mind-shaking session you will get insights on how to position your organization for growth, customize your message with your various prospects, look at ways branding can help or hinder your efforts and learn easy methods to drastically improve your results. Get tips on ways to market your business with the least amount of effort for the greatest return. Discover how to present your value so customers will take action now. Come laugh and learn how Chocolate, Elephants, and Wrinkle Remover can get results and growth for your organization. Find out how “Cheesecake and Grocery Bags” can help you get more motivated customers who will "buy" now. Highly interactive, entertaining, and packed with insights and tools to help you move your group to the next level. In this highly interactive session, participants get to C.A.S.E. (Copy and Steal Everything) ideas from each other. They take their best ideas and run them through the Event & Experience Builder Worksheet. This tool draws best in class practices and insights from the most successful organizations including Hollywood, Disney, Nicole Kidman, and others. At the end of the session, participants will have marketing plans and events that have WOW. Their events develop Word-of-mouth zing and advertising explodes. Help your participants get results, have fun, and develop creative events, marketing, and participation. Materials utilize information in Kordell’s book: Throwing Gas on the Fire – Creating DRASTIC Change in Sales and Marketing. Research is now showing that the practices of most sales people do not work. “Closing techniques”, “overcoming objections”, “features and benefits” were invented in the 1920’s and not only don’t work, THEY DRIVE AWAY CUSTOMERS! Cutting edge sales skills now require the consultative skills of a doctor or lawyer. To become a trusted advisor you have to know the four types of questions that are used by top achievers. You must learn how to pull out the customer’s priorities, passions, and problems . . . to become consultative. · Learn how to comfortably “move up the food chain” and engage senior executives who have the economic ability to say “yes”. . . even when they don’t have the budget. · Motivate customer’s to take action NOW. · Find out the one thing that top producing sales representatives ALL do that sets them apart from mediocrity. · Discover how to create “champions” within your customers, who sell you internally. This session will give you an easy to use method that is brilliant and yet simple, that gets results. You will find yourself selling in ways that make you a strategic partner. You will be able to proactively control the sale using your clients own vision and directions based on the skills you get in this session. Come and see why 41 Universities now use this information to train their corporate clients. From the book - Spontaneous Combustion – Discovering the Customers Pain, Passion, and Priorities by Kordell Norton. Grow or die! Without a focus on prospecting and adding new customers, your growth will be average at best. Why settle for ten, twenty, or thirty percent growth when you can have 100%, 200% or 300%. In this, hands on session participants will get easy to use worksheets and simple insights to get explosive growth. These tools will help them prioritize both existing and new customers to get the biggest growth with the least amount of investment. They will discover how Value Statements will give you powerful telephone messages that get call backs. You will develop prospecting plans that bust through the noise, improve networking, and overcome the fears of outdated prospecting methods. Materials from the soon to be published book of the same title. In this interactive and educational presentation, you will discover the keys to powerful marketing that will connect with your customers and motivate them to take action. Laugh and learn as we look at how to get explosive business growth with seven key elements that are necessary for sales increase. · Learn how Strategy and Execution and Marketing must be tied together. · You will get insights on how to stand out in your market while developing your unique value. 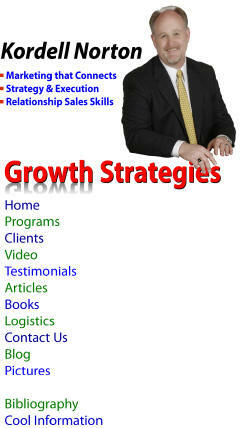 · Make your sales grow by learning which of your offerings will be the easiest to capture . . . and have the greatest success. Entertaining, humorous and insightful you will learn how change your Now to WOW in this fast paced session. Whether it is steamed milk at Starbucks, why mousetraps can make your business better, or why Silly Putty helps the world’s greatest violinist perform better – you will walk away with tips and tricks to grow your business and to get results! Materials match Kordell’s book: Marketing Moxie, Connecting with Customers & Strategies for EXPLOSIVE Business Growth. Great as a Vendor Only session before the official conference (a bonus for your vendors) or as a session on those who want to understand how to make every Networking opportunity a plus for their business. Teaches how to attend networking events to get new business, and how to construct an Elevator Speech that really works. Covers the do's and don'ts of Facebook, LinkedIn, Wordpress, and YouTube and how to use them to your advantage. Your audience will get the secrets to proactively changing their business and not waiting for “luck” to kick in. Captivating and engaging, your group can understand how to create a world-class strategy that motivates employees and your customers. However, what good is a vision and mission if you cannot make it happen? This high content presentation looks at what goes into great strategies. The second half explores the world of HIGH EXECUTION. Discover the leadership absolutes that will move away from the average and join the 20% who get results! Learn why Strategic Planning is not enough anymore. Discover how to develop mission and vision that compels, motivates and inspires. Take the complex world of strategic planning and execution and make it easy to understand and to put into practice. For smaller groups Kordell, a certified graphic facilitator does real time with graphics and illustrations. For large groups the use of animation is used. Both are entertaining. Add humor, examples, and interaction and this is an experience to not be missed. Are you creating the Vision and Leadership that inspires and engages the team? Great for those who want create a plan and execution for results. Get buy-in from all of your stakeholders with consensus and synergy. One-page overview of Sales Program - click here. One-page overview of Marketing Program - click here. One-page overview of Strategic Planning - click here. Inspiration, excitement, high energy and fun. At the same time you want someone you can trust to not insult or offend your audience. You can trust Kordell in a presentation that is both uplifting and educating. With presentations to Associations, Rotary Clubs, Chambers of Commerce, and Schools and Business, Kordell brings insights and information that will entertain and lift for groups of all sizes. For more information on GREAT Sales, Marketing and Customer Satisfaction Workshop. See what others said who recently sat through this information. You want to build or update your Strategic Plan but are hesitant because of the time commitment? 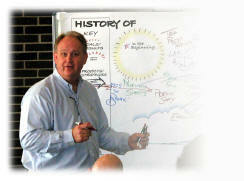 Our revolutionary process using Group Graphics can take your team through Strategic Planning in days. In addition, the process pulls your team together on focus AND gets them to high level performance. . . quickly. All of this saves you time and money. Statistics show that our process . . . Titles - following are some titles for leadership from some recent programs. Your team looks to you and the other management resources to lead, guide and have the answers to key questions. Your organization knows they need powerful leadership, but HOW do you get it? Our workshops have you and your team define leadership for your organization, what it looks like and how to apply it. Leadership Audit - use this form to help us customize our material to get you the greatest return on investment in the shortest time. The culmination of 10+ years of building customer service organizations, our "Customer Service/Customer Value workshop uses a combination of multimedia, training "maps" and specific customer feedback to build your organization. Dedicated to building customer "Wow" this workshop has been used by Compaq Computer, the Social Security Administration, United State Enrichment Corporation, Microsoft and others. Can we help you turn your Lemons into Lemonade? It is more important with each passing day to get closer to your team, to have them performing at a high level and have them focused on the right goal. Our Team Building experience uses The Drexler-Sibbet Team Building Model (copyrighted), in connection with assessments that allow an "scientific" focus on the strengths and weaknesses of your team. Your group will receive then customized and focused exercises, experiential games experiences, group and/or individual profiling that fuel discussions as we help you move your team to high performance. Your organization has a strong interest in the "top line" for growth. As a consultant, speaker, author, Kordell Norton works with corporate, association, education and government organizations who want to focus on branding, sales, marketing, strategic planning/leadership, team building, and customer service. Kordell was an executive with several multi-billion dollar corporations with executive suite positions in sales, HR, marketing and call centers. As a certified Graphic Facilitator, he uses highly visual processes, along with humor, and entertaining methods for powerful, high energy presentations.